This week we review Gen Con 2014 and all the golden DCC RPG goodness unleashed therein. Join us as the two Judges who attended the con struggle to maintain post-con coherency and voice quality, while the other two express their feelings of excitement and envy. 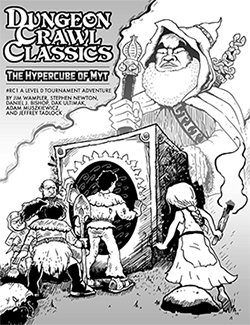 We talk about all the DCC RPG new releases, forth-coming releases, and other big announcements, as well as the first-ever DCC RPG tournament and the ever-growing phenomenon that is Doug Con! Hey y’all – love the show, long time listener, first time emailer. Hey, next GenCon – whoever makes it out there needs to come roll some DCC with me! I ran exactly one session of DCC this year, and it got called due to Sleepy. I AM NOT SATISFIED! See you in 2015. If there are hours enough in the day, sir, you are on. I linked the DCC Modules into a single campaign, so the Emerald Enchanter(ess) is really Emirikol’s ex. Now the Return of the Emerald Enchanter won’t fit. Here in the UK I don’t know half the dudes you refer to at Gen Con, but as usual the wit and humour of yuur podcast produces enough mecurial side-effects to keep me listening. Well if we could just get Simon Todd playing DCC RPG, THEN we could talk about some trans-atlantic friends! Jim has me dead to rights … sleepwalking and talking are really just the start of the problem. Usually I am carrying my sleeping companions to safety (from an imaginary threat that only I am aware of). Dreamlands fodder. Thanks for taking the question guys! I actually used your tip when creating the Carnival of the Damned tournament. I think, for the most part it came out okay with a few encounters needing some adjustment, and others being spot on. It definitely makes it a lot easier by using printed stat blocks. I also appreciate your ideas, Jim. Great way to set the tone early, with a potential TPK initially!